Please select an option Black Brown Red Please select a Color. Top zipper closure. Adjustable and removable shoulder strap. 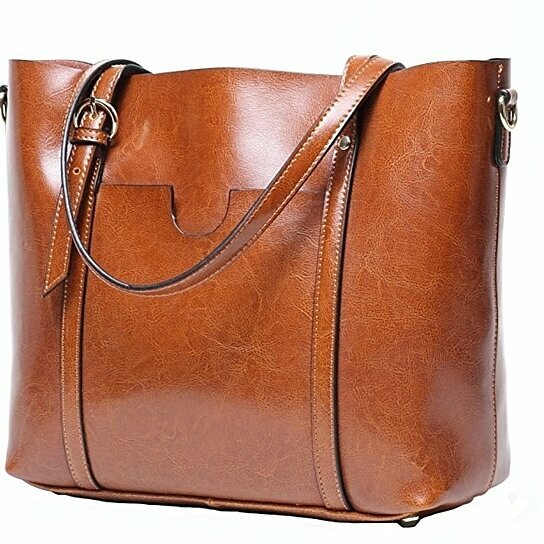 Material: High quality cow split leather,process with oil wax,so it looks more bright.Along with many delicate and clear texture.Lining is polyester.Handle reinforce with metal rivet,which have excellent bearing capacity. Structure: 2 main compartments organization,1 middle big zipper pocket,2 small holder pocket for phone and card.1 small wall zipper pocket.you can carry your iPad,laptop,mobile phone, wallets,umbrella,notebook.Exterior with a zipper pocket on front side,hold your phone key or coin bag etc. Benefits: This tote bag goes well with any outfit.Just image that you are working or traveling along this tote handbag around your arms,you must be elegant!You will feel comfortable to wear it over your shoulder. Dimension(L*H*W): 11.8"*10.6"*4.7",drop handle height: 10.2"; weight: 2 pounds.